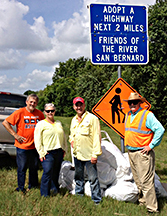 FOR volunteers collected trash along two miles of FM 2611 before and after the Churchill Bridge on Saturday, June 22. FOR San Bernard has signed an agreement with TXDOT to pick up trash along this road on a quarterly basis with the Adopt A Highway program. If not collected, this trash washes into the San Bernard. Twenty-six bags of trash, thrown by people who have no self respect for themselves, no respect for others, and no respect for their neighborhood was picked up. Adopt A Highway Chairman George Zwicker thanks the volunteers who braved the heat and mosquitoes to do this job - Nick Fratila, Marilyn Shockley, Valroy & Adalia Maudlin, Fred & Nancy Kanter, Mike Pudlo and Wayne Head.